Hitman Go is fresh take on the classic assassination game for consoles and PC. Players control a piece representing Agent 47, an iconic character from their PC and console franchise Hitman. Players work their way around a diorama-style board, turn by turn, to eventually take out their mark. Enemy patrols move after you move, and combined with special tiles for hiding and bonus objectives, you’ll find yourself in some very tricky situations. The stiff, plastic art style and physics, soothing music, and smart, classic puzzle gameplay combine to make a really memory experience. One of the main selling points of this game is that it looks interesting and unique. The levels are played on small elevated platforms, with wood frames and a name plate with the level number. It’s like playing with a little diorama. Each one a little different, but clearly connected to the last like a series of contiguous missions. The textures are very simple and clean, but that fits with the visual style – it’s a land of plastic assassins. The edges are mostly very clean, which is especially important when you’re not relying on complicated textures and backgrounds. 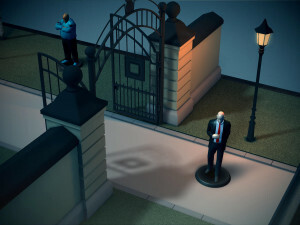 Hitman GO is mostly successful in this area. There’s a tiny bit of aliasing visible, but I wouldn’t call it a problem. The heavy use of lighting and shadow is a good move as it gives the somewhat sterile spaces some depth and detail. Bonus points for immersive mode on Android 4.4 too. When I say this title is modeled after a board game, I definitely mean it. You can probably tell from the screenshots, you really are just sliding little statues around. I’ll get to the visuals later, but the gameplay has a delightfully retro appeal. Agent 47 takes turns moving a single space at a time with the enemies – you move, then everything else on the board moves one space at the same time. You can only move along the lines laid out in the level, and you have to move each time your turn comes up. Sometimes that means you’re going to die no matter what, but that just indicates you screwed up somewhere and backed yourself into a corner. 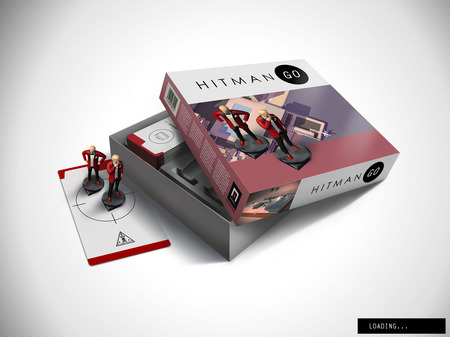 Hitman Go is basically a puzzle with additional strategic elements on top. You can only take out enemies if you approach from the side or the back. As an aside, I love that captured pieces get tossed over to the table next to the “game board,” like a game of checkers or something. If a guard is looking your direction from one space away, he’ll instantly close and assassinate the assassin. The goal is to reach the end of the level and sometimes to take out a target along the way. Killing the guards is usually optional. In fact, there are often challenges that require you to kill no one.